Slippers. These are for ladies only. This little "tin" dog has been a part of sci fi culture for decades. He has a computer for a brain, can shoot a laser out of his nose, and can use his ears for long range detection. In the television series his dead pan comments and reactions come off with a wonderful dry humor and was often a great foil for the intrepid Doctor. These slippers are soft and plush and just the perfect thing for watching episodes of Doctor Who and catching up on the past 50 years of shows. They are made of 100% polyester and have embroidered details. The bottoms are non-skid so that you will safely remain upright. 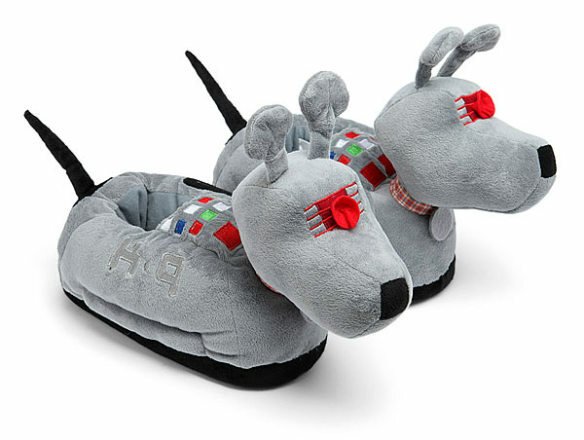 This is officially licensed Doctor Who merchandise, so these slippers can be the perfect addition to your Whovian collectibles. 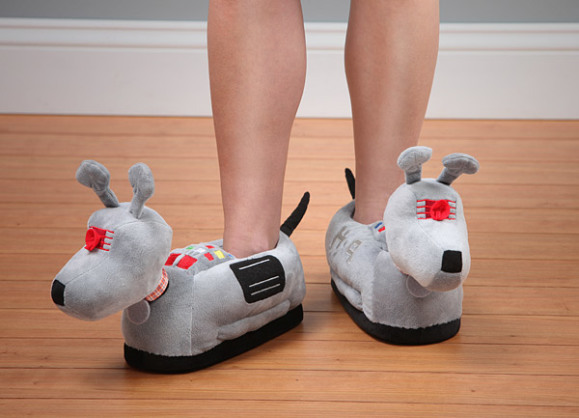 To order your own pair of Doctor Who K9 Slippers, click here.